It’s heartbreaking when you have to patiently wait for your 20’s so that you a have smooth and clear skin. Everything goes pear-shaped when you learn that bad looking acne don’t actually end during your teenage years. Getting to cope up with adult acne is quite difficult. However, get assured that you are not the only person that has to deal with acne. According to dermatologists, pimples have been meeting with wrinkles. It’s a phenomenon that specialists are noting that it has been elevating in the past 10 to 20 years. Acne can even catch up with adults that are 50 years old even up to menopause. If you experienced acne during your teenage life, there are higher chances that you have an oily skin that is susceptible to breakouts. Nevertheless, even if you didn’t have, there is still a chance that you will end up with adult acne. The outlook of acne during adult life is so dreary. Starting to develop wrinkles then teamed up with acne really sounds like a joke. However, understanding both deep and minor causes of the acne that is making your complexion unbearable is the best solution to get rid of all your woes. When you find the reason, you might clear up your skin and also avoid breakouts. The following is an insight of the various reasons that cause your skin to break out and develop acne. Fluctuation of hormones is the major factor that is wrecking chaos to your complexion. Hormones tend to undergo imbalance during menstrual cycles for women. Hormones such as progesterone, estrogen, and testosterone are the major culprits in this matter. These hormones are heavily affected during the stop and start of birth control and also during pregnancy. Normally, during teenage years, there is a lot of hormonal imbalance that transpires in young girls when at puberty and also when they get to start having their periods. In women, hormonal fluctuation doesn’t tend to end after adolescence. It’s very common to suddenly get acne if you are a woman even after your childbearing tenure. Hormones function differently to cause unintended skin breakouts. Androgen is a male hormone that tends to cause excessive production of sebum in your skin. If the male hormones are imbalanced together with the female hormones which include progesterone and estrogen, it may trigger your body to overproduce oil in the skin cells. Acne can really make someone go nuts, they destroy one’s complexion. If you practice birth control, there may be some relief as it calms the skins breakout. However, to others, birth control can prove to do the opposite. It can cause sudden skin breakouts after you commence taking the birth control pills. 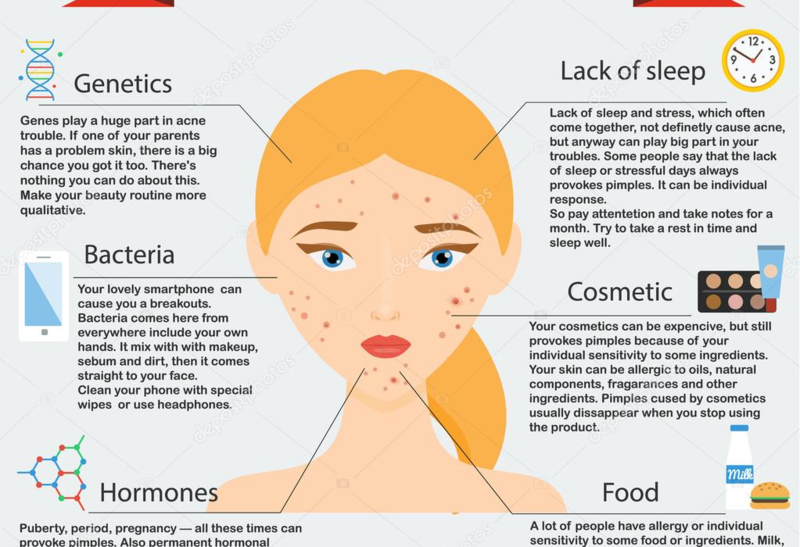 The approach to solving acne challenges using birth control measures is quite unpredictable in relation to different persons. If you were prone to acne before, when you start taking birth control pills it can assist solve the issue. If you didn’t break out before you commenced the birth control technique, the hormonal fluctuation can cause new skin problems. This is another significant factor that might be contributing to your sudden skin breakout. As highlighted above, the main cause of skin acne is a hormonal imbalance. When you are stressed, the body releases cortisol hormones releasing into the bloodstream. When testosterone surges, it causes your skin oil glands to excessively produce oil, therefore, raising the chances of bacterial infection to proliferate in your skin pores. Pimples form on the skin. When the skin starts to break out, you become emotional because you are losing self-confidence. This, in turn, leads to more stress which powers the cycle of your skin breaking out from the amount of cortisol produced by your body. To Treat adult acne, it’s advisable that your life remains stress-free at all times. You can lower the stress levels by exercising, meditating, doing yoga and practicing a breathing awareness. These are great methods to alleviate or reduce stress. Exercises are the most effective in breaking down the production of cortisol in the bloodstream. Don’t undermine moderate exercises. They release serotonin and endorphins which drastically lessen the levels of stress hormones. Moderate exercises also assist your body to crack sweat releasing out all impurities which include excess oils, salts, and water. Ensure that after post workout you wash your skin and cleanse it with clean water. It’s essential that you keenly observe the ingredients that are used to manufacture your adult acne care products. The beauty products should be non-comedogenic and fragrance –free. And even if they’re not, it’s critical that you know your skin type and then slowly comprehend the products that work best for you. If you are undergoing hormonal fluctuations, using acidic skin products that have active ingredients like Glycolic and Salicylic acid are the best topical solutions for your skin. They efficiently break down the oils clogged in your skin pores. Diet can also be a major problem. Studies have noted that the inflammation caused on your skin and body as a whole is caused by the diet that you practice. Foods high in glycemic index, excessive in sugars and also carbohydrates that elevate your insulin levels are the major causes of skin inflammation.